As you can tell, I LOVE NUTELLA SO MUCH!!!!!!!!!!!!!!!!!!!!!!!!!!!!!!!!! But I restrained myself and I had my usual brunch this morning, which I'm not sure I've ever told you about! But let me start from the beginning. So, anyway, with two slices of the very best bread in the world, I add some almond butter and jam. I don't really have any brand loyalty for jam, but recently the Superfresh had a sale on Bonne Maman's jams, so I picked up some Raspberry Preserves and it's quite delicious! P.S. their website is very pretty, but also entirely in French. Anyone have a favorite jam I should check out? Then, of course, to round out the meal I make myself a cup of Yorkshire Tea Gold. It's a pretty spectacular brunch and it keeps me full for HOURS, which is why I love it on the weekends. Anyway, back to my crazy love for Nutella - well, I made raisin bread the other day and it was just fantastic! I kept thinking that if I bought some Nutella, then it would be like eating melted raisinets (aka the best movie theater candy ever) on bread. How delicious does that sound? Very delicious. P.S. I am sure you know, but just in case you don't - I am running a contest for a $25 McCormick & Schmick's gift certificate. Comment here to enter. I love this post! I seem to find a way to dip in random things like pretzels, crackers, (anything that will pick up nutella without too much effort) as an after dinner treat quite often :) oooh and great job dan! That is so fun!!! I have a nutella addiction. I can't even keep it in the house! Imagine my joy when I went to a supermarket in Germany and found the super-mega-sized jar! 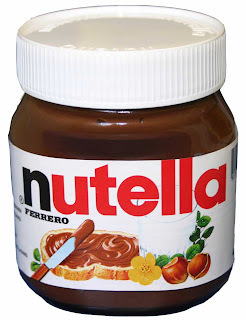 Oh, darlin' I hate to tell you -- Costco has double pack supersize jars of nutella. 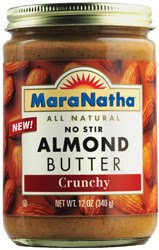 also enormous jars of almond butter. I have stopped buying it because the Princess really does eat it with a spoon, and I get annoyed when I think there's some for my bread and it's gone.